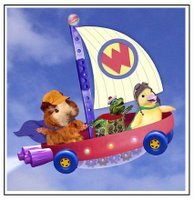 So you would like to recreate a Nickelodeon's 'Wonder Pets' episode yet you don't have a 'fly-boat' available to "save the day". No problem. Let me show you how it's done. First and most importantly you must lock your bedroom door to keep your Mommy and Daddy out. If they get wind of "an animal in trouble" they will quickly barge in and halt your filming production immediately. Lastly, whatever you do be careful not to drop the 'fly-bus' or crash into anything. This will cause your Piggy to squeal in fright and your Mommy and Daddy will bust through the door in seconds flat. Which isn't necessarily a bad thing especially if your Guinea Pig is fat and stuck inside of the school bus. You'll learn the importance of "Teamwork" when Mommy and Daddy help you dislodge your entrapped Piggy and safely place him back in his cage. Then they can bribe him with celery so he doesn't phone those PETA people to report his alleged hair raising experience. SNORT!! Thatta girl little katie!! Don't let Etour and Travel Rip you off too!